This is a complete account of the Hindu festival of Ganesh Chaturthi, and how Ganesha is worshipped at home and in public on the occasion. You will also know the essential aspects of the Hindu domestic worship, Puja (or pooja). Ganesh Chaturthi or Vinayaka Chaviti is celebrated in honor of Lord Ganesha, who is also known as Vinayaka, Vighnesvara, Ganapathi, and by numerous other names. He is one of the most popular deities of Hinduism and regarded as the leader of Shiva’s bands of warriors (ganas). The festival falls on the fourth day in the first half of the month of Bhadrapada according to the Hindu calendar, which approximately corresponds to the months of August or September. Being a popular festival, which heralds the festive season for the Hindus, it is celebrated throughout India, and abroad in several countries, where Hindus are present. We do not know when, and how the tradition of worshipping Ganesha on Chaturthi began. Lord Ganesha was not a Vedic god although scholars draw a connection between him and the Vedic deity, Brihaspathi or Brahmanaspati, the teacher of Vedic gods. However, he is mentioned in the Mahabharata as the deity who transcribed the entire epic when Vyasa narrated it to him. He might have been a popular a deity of the Agama and Tantra traditions of Shaivism or Shaktism or both. Yajnavalkya Smriti ascribes to him negative qualities. Some scholars suggest that prototypes of Ganesha were worshipped in prehistoric times even outside India. The tradition of worshipping an elephant headed deity might have been prevalent in the royal armies, where elephants played a prominent part in the battlefield as the destroyers of enemies. Alternatively, he might have been a deity of the rural and folk traditions in the areas where agricultural crops were exposed to frequent destruction by elephants and rats. Whatever may be the antecedents, Ganesha was a popular god of Hinduism by the medieval period. Images of Ganesha were unearthed from several sites, some of them as old as 7th Century AD. There was an ancient sect by the name Ganapathya sect (6th Century AD) which worshipped him as Brahman himself. The popularity of Ganesha Chaturthi on a scale that we witness today is a recent phenomenon. Few decades ago, the festival was celebrated in public in certain important towns and cities only. Most people worshipped him at home, since it followed immediately the harvest season and heralded the beginning of new festive season for the Hindu year. For common people, it was an occasion to express gratitude to the deity and seek his help and protection in their personal lives. They prayed to him for success and prosperity in their lives and celebrated the festival with great enthusiasm. Nowadays, the social or communal aspect of the celebration is more striking as it is celebrated in public on a massive scale with great pomp and color almost in every village, town and city of India, and even abroad. The public celebration of the festival said to have begun in the Maratha kingdom, especially in Pune, during the time of Shivaji (1630–1680 AD), the great Maratha ruler and founder of the Maratha empire, which at its height covered vast tracts of central and southern India. The Peshwas, who were the royal administrators of the empire, continued the tradition. They worshipped Ganesha as their family deity (Kula devata) and built many temples in his honor. After the fall of the Maratha empire, the public celebration of the festival fell into disuse. In places like Goa, the public celebration of the festival was even prohibited. The celebration of the festival continued at several places in the erstwhile Maratha empire such as Gwalior, however on a very subdued scale. The tradition was again revived in Maharashtra in 1890s by Bala Gangadhar Tilak, one of the well-known public personalities and freedom fighters of British India. In the public appeal of Ganesha and the festival, Tilak saw a huge opportunity to unite the native people against the British regime and inculcate in them feelings of unity and nationalism. It was under his initiative people began to install large public images of Ganesha in the pavilions during the festival and carry them in large processions through crowded streets for their submergence in the water bodies. In time, the festival became popular throughout India. Nowadays, people celebrate it as one of the major and popular Hindu festival. Because of the festival and the visual appeal of the deity, Ganesha is currently one of the most popular and celebrated deities of Hinduism. How the festival is celebrated? As stated before, the festival is celebrated by people both at homes and in public according to convenience. Both are not mutually exclusive. People worship him both at home and in public if it suits them. Traditionally, it is celebrated from 1-14 days according to convenience. Some do it for only one day, and by evening carry the statue to a water body and immerse it. Others do it for three days or seven days. The public celebrations usually continue from10-14 days. The first day is the most important, since it is the day on which the deity is invited to the place of worship through invocations and directly worshipped in living form. From then on until the day of immersion, he is worshipped with reverence and devotion. People from the neighborhood continue to visit the places where he is installed, offer their homage and participate in the celebrations. Although household celebrations are more common during the festival, public celebrations receive wider attention due to the festive atmosphere, community involvement and the intense business and commercial activity they generate. On the day of the festival, men and women wake up in the early morning. In the rural areas men go out, bathe in the public ponds or canals and go into the fields. They collect leaves, flowers and twigs for the worship and return home to make further arrangements. Women also wake up in the early morning and prepare various types of traditional foods and delicacies, which are known to be dearer to the god. In urban areas, people mostly buy food as well as ritual material from local vendors for the worship. The worship of Ganesha lasts for a few hours and is usually done in the early morning. It may be done by the devotees themselves, or with the help of priests. If the priest is involved, a day or two before the worship, he will give elaborate instructions as to what materials should be kept ready and what arrangements should be made. There is an advantage in engaging priests since they recite the mantras with accuracy and take care of the ritual observances, with which common people may not be familiar. However, since Ganesha is a Saiva deity, there are no caste restrictions on who should or should not worship him. People from all backgrounds have the permission to worship him directly. If there is any requirement, it is about cleanliness, commitment, devotion, and sincerity. Ganesha is a god of benevolence as well as destruction because of his association with the Tantras. Hence, no one should take liberties with him or invoke his wrath. The worship of Ganesha is an elaborate ritual. It is mostly based upon the smarta tradition, and follow the same pattern as in case of the worship of many other deities. The central idea is that you invite the deity, the way you will invite any guest who visits your house, and you will honor him with love and attention. To begin with, you give him water to wash his feet (padyam), water to drink (achamaniyam), and a comfortable seat (asanam) to sit and relax. Then, you make arrangements for his bath, give him refreshments, clothes and food and have a nice and pleasant conversation with him through numerous chants and prayers while he enjoys the food you serve and the love and attention you shower upon him. Finally, when all observances are done, he blesses you, grants your wishes and goes his way. The following is a traditional account of the worship of Ganesha. There can be local and regional variations, but this is the standard format. On the day of the worship, devotees should choose a place in the northeastern corner of the house to conduct the worship. They should clean it with water and decorate it with flowers and traditional floral designs. A wooden stool, not very low or high, should be placed at the center of it, which should be cleaned and decorated because it is the foundation for the whole ritual. A statue of Ganesha, made of clay or even rice paste, should be placed on it, and decorated with vermillion, turmeric, and sandal paste. A clean betel leaf should be placed on the stool, on a bed or rice, before or by the side of the Ganesha image. An image of the Ganesha should be made with turmeric paste and placed on it. Oil lamps should be placed in the corners and lighted. A few incense sticks should be lighted and placed in the stand before him to create an atmosphere of reverential solemnity. After these preliminary arrangements, family members should sit before the deity in a group and start the worship. The ritual worship should begin with the utterance of Aum or a prayer. Usually, the devotees begin it by chanting the names of Kesava (kesavanamas). Then the worshipper should do self-cleansing (atma-shuddi) by sprinkling water on himself, followed by cleansing of the earth (bhu-shuddi), uttering specific mantras for each cleansing ritual. The next step is reciting the Gayatri mantra, or any mantra traditionally used by the family or given by the guru, and making a declaration of intention (sankalpa). In the sankapla, worshippers have to specify clearly at what place, on what auspicious date, time, and moment, in which week, month, and season of the calendar year, which persons, belonging to which gotra and family, for what specific purpose (health, wealth, etc. ), and for the satisfaction of which deity or deities they have gathered to conduct the worship. The wording is a standard format, which is used in almost every Hindu ritual worship. After that, they have to install the sacred water pot (kalasam) by decorating it with turmeric, vermillion, flowers and coconut, chanting appropriate mantras. Next, they have to throw a few turmeric mixed rice grains (akshatas) on the image of Ganesha, touch it with their right hand, utter a few mantras to invoke the deity and install their own life breaths. This ritual is called Prana Pratishta. After the deity is firmly installed in the minds and hearts of the devotees, they have to proceed to worship him further in the following manner. Each of the below mentioned step involves an offering accompanied by a prayer or a mantra and the sequence is more or less the same. It is done according to the traditional, Hindu manners and etiquette, which are customarily extended to any guest who visits the house of a Hindu householder. Dhyanam: A prayer is offered mentally or verbally to Ganesha, extolling him. Avahanam: Ganesha is invited along with his vehicle (vahanam) to the place of worship with a reverential mantra. Asanam: Ganesha is offered a seat of honor, which is customary in Hindu tradition when a guest arrives. Arghyam: This is cleansing ritual in which water is sprinkled on the deity with a flower, along with a mantra and a salutation. Padyam: This is an offering of water to Ganesha for the cleansing of his feet, and again it is part of an honor that is due to a guest who comes by walk from outside. Achamaniyam: It is an offering of water to the deity for drinking to quench his thirst since he has come from a long distance. Madhuparkam: This is an offering of sweet beverage made of curd, honey, Jaggery, or sugar for drinking. Any sweet drink will do. Panchamruta snanam: In this, the deity is offered the sacred mixture for ritual bathing, which is made of five types of substances namely cow milk, curd, ghee, honey, and sugar or sweet water. Suddhodaka snanam: It is the offering of clean water (gathered from various rivers) for ablution or a clean bath. Vasthram: This is the offering of new clothes according to one’s capacity. Usually in the rituals a piece of cloth or cotton yarn is placed before or on the deity. In more elaborate rituals real clothes are gifted, which go to the share of the main priest. Upavitham or Yajnopavitham: This is the offering of sacred thread, which is traditionally worn by the Brahmanas and a few higher castes. Gandham: This is the offering of scent or sandal paste mixed with other natural salts and perfumes (karpuram and kasturi) for the deity’s body. Akshitan: In this ritual rice grains, mixed with turmeric and vermillion, are showered upon the head of the deity. Pushpam: Various types of flowers are offered to the deity. Adhanga or Sarvanga puja: In this, the devotee worships the deity’s body, specifying each bodily part along with a mantra, from the feet upwards to the forehead. Adha ekavimsathi pathra Puja: This involves the worship of Ganesha with 21 different types of leaves, which are considered very sacred and dearer to him. With each offering a specific form of Ganesha is invoked. The number 21 is probably a reference to 21 tattvas. Athashtottara sathanama puja: In this the worshipper invokes 108 names of Ganesha in reverential praise to signify his greatness, qualities, victories and virtues. Devotees should add Aum before and Namah (salutation) at the end of each name when they utter those names. Dhupam: After the above mentioned ritual, one should light a piece of camphor in a plate or in large spoon, offer it to the deity and show it to the worshippers for their salutations. Dipam: This is the offering of light or a lighted oil lamp (arathi) to the deity, accompanied by salutations and prayers as mentioned above. Naivedyam: All types of food, which is cooked in the household for the specific purpose, along with water and sweet drinks, should be placed before the deity and offered with great love and devotion. Suvarna Pushpam: This is an offering of flowers to the deity as an honor and respect, after he has been served a good meal to make him feel more comfortable and at home. Thambulam: It is an offering of betel nut, limestone paste, spices, and sweeteners wrapped in betel leaves, which serves as a mouth freshener and digester. It is usually taken after a meal by many traditional Hindus. The paan or khilly is the modern version. Neerajanam: This is an offering of prostrations before the deity by the devotees to express humility, devotion and surrender. Atha doorvaa-yugma puja: This is an invocation of 10 popular names of Ganesha. Mantra pushpam: This is a salutation to Ganehsa by the worshipper, holding flowers and a few coins in the hands to express reverence and gratitude (sumanjali). The money is given away in charity or to the priest. 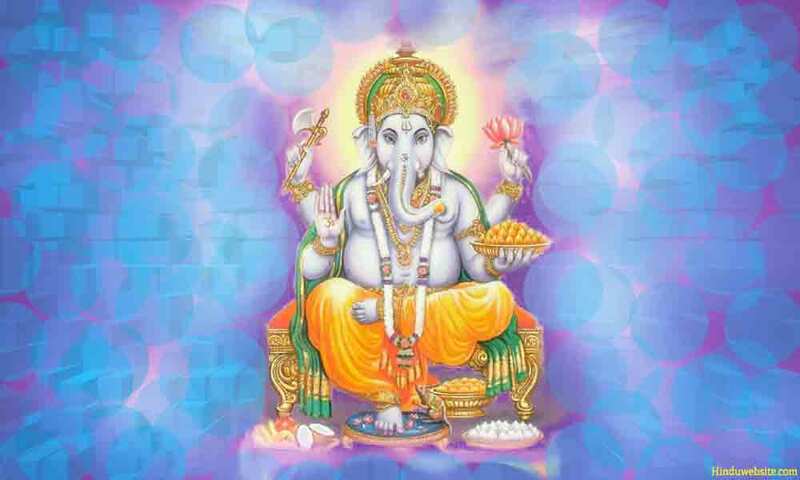 Prarthana: This is the offering of a prayer of praise, seeking the blessings of Ganesha for success in all endeavors. Devotee may also do pradakshina (circumambulations) around themselves, while they pray. Vayana danam: This the gifting of traditional sweets, snacks or cakes, which are usually offered to a guest for his return journey before his departure from the home. Pratigraha mantram: In this a reverential prayer is uttered by the householder and his family to Ganesha, requesting him to accept the gifts that have been offered to him for his return journey. Pratima Danam: This is a prayerful farewell by the worshippers to the deity, who has thus far been established in the image, declaring that the worship is now concluded. While they recite it, they do pradakshinas, expressing gratitude, and seek his forgiveness for any mistakes in the performance of the ritual and for the sins of their past lives. At the end of it, the main worshipper or the priest places few rice grains upon his own head, and moves the images slightly with his right hand. The act denotes that Ganesha has departed from the statue in which he was previously installed and left the place of worship to return to his abode in Kailash. Katha: According to tradition, the ritual worship of Ganesha on the day of the festival is incomplete unless worshippers listen with devotion to the stories of his exploits and greatness, and know the significance of Ganesh Chaturthi and the importance of his worship. Devotees do not leave the place of the ritual until they listen to his stories, as the priest or the main worshipper narrates them. Once the narration is complete, they once again offer an Arati (light) to Ganesha and conclude the worship with benediction to all who are present. Prasadam: In the end Prasadam, or the remains of the sacrifical offerings are distributed among all the worshipper who grace the occastion. After the worship, the family members share a rich meal and celebrate the occasion. Nimajjanam: This is the immersion of Ganesha statue with the ritual material in a pond or water body to signify that the tattvas that are present in the temporary body of Ganesha which was created by the worshippers for the specific purpose have been returned to their natural, elemental state. The money which is collected for the festival is primarily spent to purchase the statues of Ganesha, erect ceremonial tent-shelters or awnings, which are known as shamianas or pandals where the statues are installed, to decorate them, and to organize daily worship. From the day of the festival and until the day of immersion, Ganesha is worshipped with a lot of devotion and fanfare. People visit the pandals according to their convenience and pay their respects. Besides worship, organizers arrange several cultural and entertainment activities such as singing, dancing, religious discourses, play acting, devotional singing, and games, in which people of all ages participate and enjoy. The statues for the celebration come in various shapes and sizes, some as tall as 50ft to100ft. On the seventh, tenth or 14th day, depending upon their convenience or local practices, people carry the statues on trucks, chariots and other vehicles in large processions to the nearby ponds, lakes, rivers, and seas and immerse them. As the festival has become extremely popular, the large scale immersion of Ganesha statues in local water bodies every year has raised numerous concerns about water pollution and other environmental problems. In some parts of rural Andhra Pradesh, a few days before the Ganesh Chaturthi young people collect barbed seeds of a local weed, known as palleru (bristly starbur or Texas cockspur), and spray them on the roads to trouble those who walk in the streets barefoot. It is to mark the unruliness of Shiva Ganas who are headed by Ganesha. Hence, people take the trouble lightly, and let the young ones have their fun. This practice may be unknown or in decline in several places. Ganesh Chaturthi is a special occasion for many artisans and local artists in many parts of India to show their talent and artistry. Since Ganesha has numerous forms, gaits, and colors, they use their creative skills to make colorful images of him in clay or plaster of Paris and offer them for sale. The city of Mumbai is the foremost among all metropolitan cities in celebrating the festival. Millions of people from all sections of society participate in the processions on the day of the immersion ceremony. Students seek the blessings of Ganesha during the festival seeking success in the examinations. They place their books near the deity during worship and apply turmeric to the covers or corners for good luck. Ganesha is a lover of rich foods. According to the legends, he has an insatiable appetite for food. He is especially fond of traditional sweetmeats called Undrallu and Kudumulu (made of boiled rice cakes). In Goa a day after Ganesh Chaturthi, people celebrate Navyachi Pancham, a harvest festival, during which farmers bring freshly harvested paddy from the fields and worship the gods. People also refrain from eating non-vegetarian food during the celebration. In some households, people may worship Ganesha along with goddess Lakshimi. He is also worshipped along with his consorts Siddhi and Buddhi and his vehicle, the rat. The images are mostly seated forms. However in some public places, people may install standing and dancing Ganesha images also. Should December 25 be a Public Holiday in India?